Ronda A. Reagan Properties, Inc.
Beautiful, newer custom built in white brick. Elegant foyer, LR or study; formal DR. Lg fam. rm w/wood stove & entertainment center. Super big KIT w/isl & pantry, custom cab's; brkfst/sun rm too + big util. w/pantry, 2 more closets. Split BR plan features owners retreat w/3 walk-in closets, sep shower/tub. Beautiful workmanship, top of the line fixtures.High ceilings, tile flrs, lg windows. Porches. 2400sf metal barn, slab, elec. Old, metal pipe cattle pens. Pond sites. Huge live oaks. 5mi to town. Interior Features No carpet---Tile floors thru out. Great Kitchen with island and pantry. Fabulous laundry room with 3 closets, sink, cabinets. 3 walk-in closets in master bedroom. 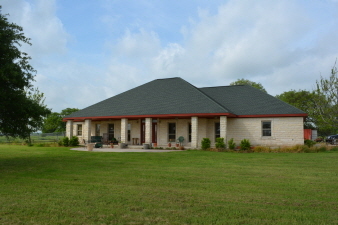 Exterior Features 50 beautiful acres of land---AG exempt for lower taxes. Huge metal barn for hobbies, ranching, business, etc. Big native Live Oak trees. 2 wells. Cattle pens. I may not be the one who sells your home, but I will be the reason why.